The material used to cover the screen is a white polypropylene needle punched nonwoven geotextile that has excellent permeability and allows the flowing inside of water while stopping the thin sediment outside. This type of coating offers good protection in clay or shale and prevents clogging. 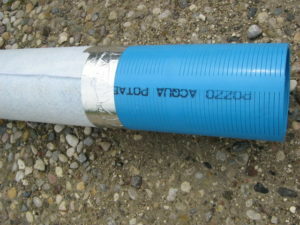 The nonwoven geotextile is double crossed texture sewed and is wrapped very tight around the screen in order to avoid that it rolls up during pipe laying.